The US military has made a final decision to cancel $300m in aid to Pakistan, the Pentagon says, citing Islamabad’s perceived failure to take decisive action against armed groups in the country. 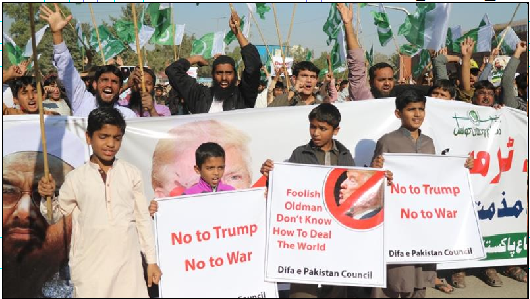 The Coalition Support Funds were part of a broader suspension in aid to Pakistan announced by President Donald Trump at the start of the year, when he accused Pakistan of rewarding past assistance with “nothing but lies and deceit”. The Trump administration says Islamabad is granting safe haven to fighters who are waging a 17-year-old war in neighbouring Afghanistan, a charge Pakistan denies. “Due to a lack of Pakistani decisive actions in support of the South Asia Strategy, the remaining $300m was reprogrammed,” Pentagon spokesperson Lieutenant Colonel Kone Faulkner said on Saturday. “We continue to press Pakistan to indiscriminately target all terrorist groups,” said Faulkner before adding that the aid amount would be used on “other urgent priorities” following Congress’ approval. A Pakistani official, speaking on the condition of anonymity, said he was unaware of a formal notification of the US decision on assistance but said one was expected by the end of September, according to media reports. “After the Trump administration took over, the president announced his South Asia policy in which he came down very hard on Pakistan. Islamabad has categorically rejected that US policy. The announcement came just weeks after Pakistan’s newly elected Prime Minister Imran Khan took office. How to prepare groundwork and increase entrepreneurship in Afghanistan?